A superb creative delay plugin that succeeds wholeheartedly in making a complex system very easy to use. Great layout. Flexible low frequency handling. Lush modulation options. Useful Mix and Timeline views. Multichannel routing. Needs smaller time divisions. Global parameter editing would help. EARebound is a fully featured multitap delay plugin (VST/AU), comprising 15 discrete delay lines, which, along with the input signal, are activated and edited via a horizontal pad layout reminiscent of a drum machine sequencer. 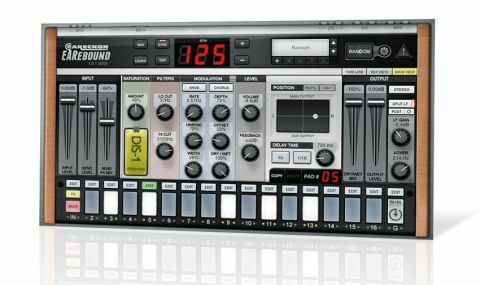 "Every parameter is individually editable for each delay tap, as well as for the input signal"
The editable parameters/effects comprise Saturation (seven types), filters (Lo Cut and Hi Cut), modulation (Quad Tremolo and Quad Chorus), Output level, Feedback, Delay time and output panning. Every parameter is individually editable for each delay tap, as well as for the input signal. It's powerful stuff - but it doesn't end there: there's also an additional global delay line that collectively processes all active taps, either with or without the input signal. An important point to note is that, because you can process the source signal, it actually becomes part of the 'wet' signal too. Thus, for flexibility, it gets its own processing bypass and Mute buttons, as well as a Send FX Mix control. Rather cleverly, the last gives you control over how much source signal processing is applied to the delay line feed (0-100%). The raw source signal (dry) is then mixed back in with all of this at the end, using the Dry/Wet Mix fader. EARebound's routing setup also features multichannel and low frequency (LF) options. Finally, the parameters of all the delays can be viewed collectively - as opposed to the per- delay, contextual presentation of the main view - in the Timeline (delay timings) and Mix (parameters) page views. "There's lots going on, but EARebound is very easy to use"
There's lots going on, but EARebound is very easy to use. If you do need a starting point, there are over 40 categorised presets on board, as well as an excellent randomise option with the ability to lock individual parameters. The default patch loads with the delay lines synced to successive 16th-notes reducing in level, but you can set each tap to any division you like. Synced delays combine a time division (16ths being the shortest and a dotted bar the longest) and a multiplier (x1-16), so x3 in 16ths results in a delay interval of three 16th-notes. This gives you the potential to create very long delays indeed, but we'd like to see smaller divisions made available too. Of EARebound's three main effects, the filters behave as expected, while the seven Saturation types offer plenty of flavour, including four valve sounds. These are great for tailoring delay degradation overall or just for selected taps. However, it's the modulation section that's most impressive. This uses four modulation lines (two on the left and two on the right), with basic Rate and Depth controls augmented by Unsync, Offset and Width parameters. Using these, we were able to come up with some beautifully rich sounds - particularly effective on guitars, pianos, synths or anything where a smeared delay effect is called for. The layout encourages real-time control, switching taps in/out on the fly, and it works pretty smooth when used like this. Although EARebound is great for the creative stuff, it's also very quick at calling up simple, precise, tailored delays - on a lead vocal, say. We do have a few things we'd like to see added, including an 'edit all taps at once' option, smaller time divisions and solo, but we understand that at least some of these will appear in future updates. Even as it currently stands, though, this is clearly another triumphant winner from eaReckon.